Opioid addiction is an escalating problem that is compounded by the introduction of synthetic opiate analogues such as fentanyl. Screening methods for these compound classes are challenged by the availability of synthetically manufactured analogues, including isomers of existing substances. High-field asymmetric-waveform ion mobility spectrometry (FAIMS) utilizes an alternating asymmetric electric field to separate ions by their different mobilities at high and low fields as they travel through the separation space. When coupled to mass spectrometry (MS), FAIMS enhances the separation of analytes from other interfering compounds with little to no increase in analysis time. Addition of solvent vapor into the FAIMS carrier gas has been demonstrated to enable and improve the separation of isomers. Here we investigate the effects of several solvents for the separation of four opioids. 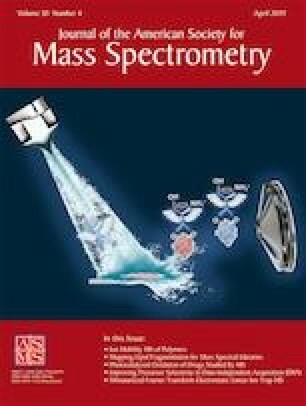 FAIMS-MS spectra with added solvent vapors show dramatic compensation field (CF) shifts for opioid [M+H]+ ions when compared to spectra acquired using dry nitrogen. Addition of vapor from aprotic solvents, such as acetonitrile and acetone, produces significantly improved resolution between the tested opioids, with baseline resolution achieved between certain opioid isomers. For protic solvents, notable CF shift differences were observed in FAIMS separations between addition of water vapor and vapors from small alcohols. The online version of this article ( https://doi.org/10.1007/s13361-019-02175-w) contains supplementary material, which is available to authorized users. We acknowledge funding from Breathtec Biomedical, Cannabix Inc., and the Partnership for Clean Competition. We also acknowledge Michelle Palumbo for her contributions in the data processing software.